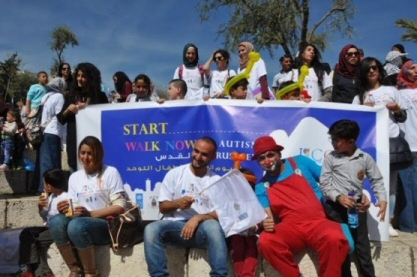 The march began in the streets of Jerusalem, with the participation of the scout teams from Bayt al-Hekma and Shaza al-Ward schools, in addition to the clowns who participated in a show for the awareness of autism children. A huge banner was raised in the march, according to Al Ray; the participants wore T-shirts which carried slogans including “March for Autism Trouble Awareness” and “Laugh With Us Autistic Children”. Director of the Jerusalem Society for Autistic Children, Khalil Jaradat, confirmed that the march was organized to raise awareness about autism patients; they are not disabled children but normal, and it is necessary to integrate them into the society of their peers. He explained that there are more than 600 boys and girls in the city of Jerusalem described as autistic patients, while the association tries to provide them with appropriate treatment programs.